We’ve made it to the final day of The Oinkster’s Burger Week and, first off, congratulations to all the Burger Lords who made it out to all 7 days. 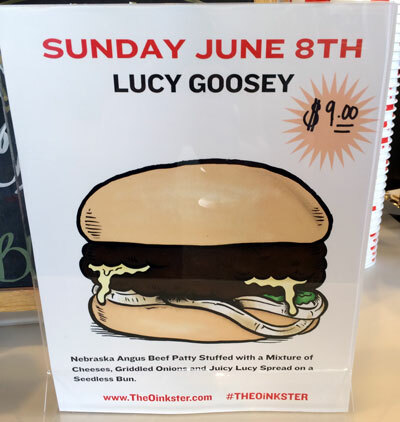 To end the week we’ve got the Lucy Goosey burger, The Oinkster’s take on the time old tradition of putting cheese in the middle of a burger. This burger consists of a Nebraska Angus beef patty stuffed with a mixture of cheeses, griddled onions and Juicy Lucy spread on a seedless bun. The origins of this burger are a bit murky, but can be traced back to two bars on the same street in South Minneapolis who both claim to have invented the sandwich, Matt’s Bar and the 5-8 Club. It has since become a staple of American burger culture to the point when even Oprah has a recipe for a turkey version on her website. The burger is a bit simpler than the rest, but within it’s unassuming appearance is a really well executed burger. The first thing to make clear is that Juicy Lucy spread is actually a mustard spread, which I am all about. The meat’s cooked to just the right point to get the cheesy center to just the right maltiness and the mustard sauce and pickles balance out the experience. 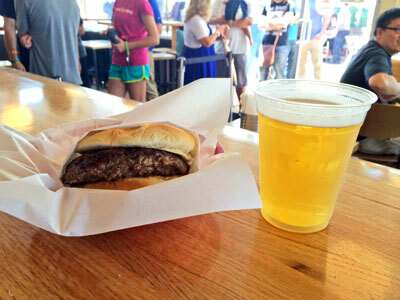 My beer pairing for this burger is Holy Jim Falls XPA from Cismontane Brewing Company. This XPA (or extra pale ale) is named after the falls at the end of Holy Jim trail in the Trabuco Canyon near their brewery. I picked this beer for the Pantera Burger earlier in the week, but think it also lends itself to this burger as well . The beer pours a hazy straw color with a small ring of bubbly head. The aroma has a nice grassy hop to it but doesn’t overpower the doughy malt. This brew is definitely on the lighter side with an average amount of carbonation and only coming in at 4.5% ABV. The flavor is pretty close to the aroma, with a nice mix of grassy hop bite and a pleasant doughy malt. The finish is crisp and dry with some lingering hoppy bitterness. The beer helps cut this intensely chessy burger, keeping your palate ready for another explosion of flavor and the dry finish makes you want another bite of the burger (or another sip of beer). The hoppiness of the beer plays an interesting counter to the mustard sauce and pickles. 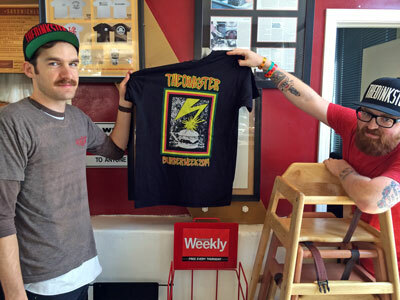 Thanks to The Oinkster for hosting this great event and all the Burger Lords for making this such a great week!